Software required : Microsoft Office Excel datasheet of free Open Office. Tips here assume some familiarity with spreadsheets and basics of formulas. I have no idea if and how they work with Apple products, sorry. The cataloging methodology I have developed here I find useful in managing my collection of over 1,500 records, which include a fair proportion of European and Japanese issues of US originals, multiple copies resulting from upgrading, and mono/stereo variations. Your own method of record-keeping and filing should be appropriate to your needs. One friend keeps his 3,000 collection hand-written in a series of spiral-bound notebooks. He seems happy enough with it, though in record shops has often to phone home to ask his wife to check what’s in the book. Whatever works for you. A spreadsheet is easier to manage, expand and contract as your collection changes, and to research and analyse. A hard copy of the collection is printed (20 pages A4) updated from time to time, and goes with me on shopping trips, to avoid embarrassment of buying the same record twice. I guess you could load it all to a tablet or smart phone, but I don’t use one. After deciding what detail you want to record about each record in your collection (etchings, vinyl weight, vinyl grade, mono/stereo, important stuff) the next biggest decision you can make, is the sort order. With a spreadsheet you have the flexibility to change as your needs and interests change, and when sorted alphabetically, you also have the backbone of a printable Filing List for more disciplines storage and retrieval. Unless you are blessed with an unbroken line of original pressings, a proportion of your collection inevitably will include reissues – in my case, many simultaneous first UK release of US recordings (reissuers often use their own catalogue number), or Japanese reissues of otherwise unobtainable Blue Notes. By identifying the original record catalogue number (e.g. Blue Note BLP 1568) and then sorting by that, all the Blue Note reissues, mono and stereo, Liberty King and Toshiba of that record fall together. This required quite a lot of additional research, as it had never occurred to me to record the original record catalog number. Here you see order, where once was chaos, mixing UK Esquires, UK HMVs, US Prestige, US Impulse and UK/US Atlantic, mono and stereo, duplicates. The following formulas in Microsoft Office Excel reduce some of the work. Formula works only for artists with a single first and last name, by locating the blank space between the two names and the number of characters to the left and right of that space, reversing the name order and inserting a coma immediately after the surname. This turns what could be a day’s work into a few minutes. I use the Artist name in the sense of which musician who is the leader of the recording, so I sacrifice for the purpose of cataloging any co-leader, or designation “quartet ” or “trio”. Art Blakey’s Jazz Messengers becomes just Art Blakey. Fancy multiple names get truncated or joined into one name with a hyphen. Surprisingly, there are often unintentional as well as intentional duplicate entries in a datasheet, so this little formula makes it easy to spot them both. Example, Title in Column C, formula in row 101 tests rows above and below for identical title. Tests whether the title in cell C101 is the same as the title in the cell above (C100) or the cell below (C102). If either condition is met, the formula returns the flag “D”, otherwise, returns nothing. Adjust the cell reference to fit your own datasheet design. Blue Note: BLP 1568 is a unique reference to a Hank Mobley recording. It is found on Blue Note Records with catalog number BN 1568 when mono, or BNST 81568 when stereo. Its release in Japan by King Records carries catalog number GXK 8225, whilst the later EMI-Toshiba release retain the US number BN 1568. Later US and European reissues tend to follow the original number. Not so Applause and some other reissue labels. 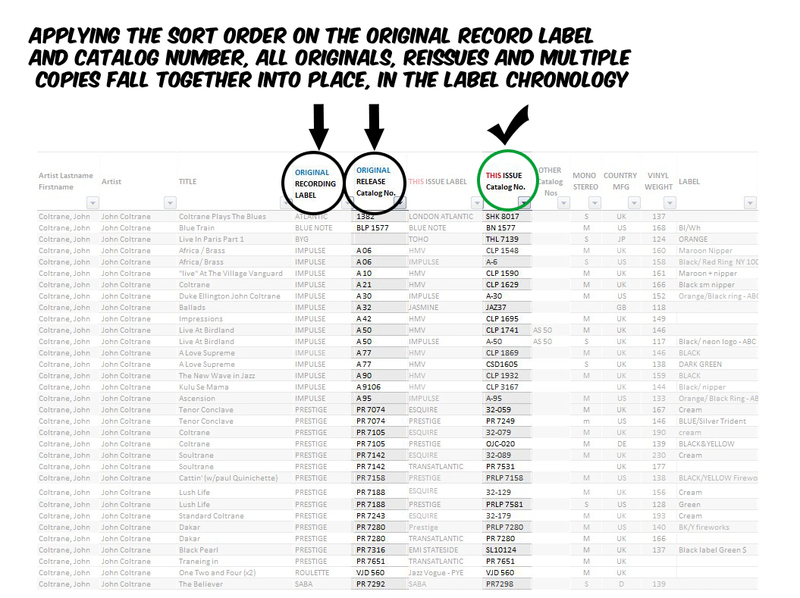 By entering the original BLP number against each Blue Note record, chronology and reissue-grouping is possible. Impulse: Impulse recordings were licensed in the UK by HMV, and pressed by EMI, until Impulse set up their own UK presence. The original Impulse catalog numbers A 1 to A 99 and higher will have an HMV catalog number, usually CLP (mono) or CSD (stereo) then a four digit number. The original Impulse number will often be found on the record label itself, and was used by EMI as the matrix number to be engraved in the run out, plus A or B.
Prestige presents a different problem. It was practice to issue a new catalog number when a record was reissued. You will often see the original number in the run-out, scratched out and replaced by a new higher number, and sometimes a third number by the time the Blue/ Trident label came into use. Because the catalog number is being used here as a machine-readable index number, to create chronology, the original first release number is the one required. The same logic applies to records released first on New Jazz (8000 series) and reissued on Prestige. Esquire UK reissues show the originating Prestige catalog number on the label, and as the matrix code in the run-out. Columbia were quite disciplined with the ubiquitous CL (mono) or CS (stereo) prefix, and four digits. For cataloging, use the mono CL release number, retaining the number for the actual record you own. UK releases by CBS carry their own BPG (mono) or SBPG (stereo) prefix and five digits. The original Columbia CL number may take some digging however Miles Davis and Thelonious Monk’s large discography is fairly easy to follow. However earlier Philips/Fontana licensing of Columbia recordings (up to 1963 and the creation of CBS) was entirely covert. Fontana use their TFL /STFL/TL prefix and four digits, and deliberately made no other reference to Columbia whatsoever, so originating numbers can be a bit painful to locate. Difficult Artists: Charles Mingus hated record companies with a passion, jumping from label to label with almost every recording, so much so that there is very little value in attempting to use catalog numbers for chronology. This applies to some other artists too. Difficult Labels: RCA Victor, Mercury and Verve used difficult formats which show the hallmark of being conceived before the advent of computers. I have only a few, so it is less of a problem. London American Jazz pressings require working knowledge of the LTZ suffix which identifies the originating US label. Recording format of catalog numbers. The purpose here is to keep numbers in a format that can be easily manipulated on a computer datasheet ie machine readable and able to sort reliably. Ideally every record would simply have a different number, but the same digits occur too frequently, and therefore a distinguishing prefix of the label is helpful – CL as used by Columbia, BLP as used by Blue Note, etc. Some catalog numbers are printed with spaces or no spaces, with dots or dashes as character separators. I use a space character to separate the prefix from the digits, and no other spaces or symbols. One artifice sometimes necessary is insertion of a leading zero to enable correct sorting, as Impulse A-6, A6 and A 6 needs to be turned into A 06. This method works, but may horrify Discogs Purists who believe only in recording exactly what was printed on the label or cover. Item listed in columns 1 – 31 From time to time I have added items and deleted other. Not all fields are relevant to every label eg Blue Note originals require extensive documentation, Blue Note Japanese reissues – King have a unique Japan number, Toshiba re-use the original Blue Note catalogue number, in both cases the address on label is not relevant as it is merely a facsimile of the original. I am in two minds about the use of abbreviations. Label: “Blue/Black” or “BL/BK”? With Excel search and replace its pretty easy to swap from one to the other as your needs change. Most important is the sum paid, which uses a formula to add up the total expenditure, and leaves an audit trail in the event of resale of the collection. Use Excel’s =COUNT and =SUM function to keep track of the size and value of your addiction. I do not try to grade the vinyl or cover. This I feel can be better accomplished simply by looking at it at a relevant time, and playgrading. However for some people the grading is an essential, as they like to do swaps and trades, so get into the EX / VG+ stuff. Excel’s essential add-in ASAP Utilities: http://www.asap-utilities.com/ I couldn’t imagine life without Bastien Mensink’s free exquisite set of Excel Add-ins – for cleaning up text, removal of hyperlinks, turning text-numbers into real numbers or proper dates, and all the things ever so rich and clever Microsoft never thought to include. Hi, my name is Eddie Carter and I’m writing a post for a few Facebook pages titled “Is Your Music Insured?” I’d like to ask your permission to let folks know of the Excel spreadsheet you provide to help cataloging an LP library or CD collection by mentioning your website and specifically the Cataloging Your Collection page. Thanks in advance and you have an awesome website. Thank you Sir and I’ll email a copy of it to your address to read at your pleasure. I’ve always been a bit of a shambles when it comes to record collecting and most other things. My wife only just managed to cajole me into putting the jazz into alphabetical order last week and now of course I can’t find anything. One of the advantage of this lack of any system is when I rediscover a record that I’d forgotten I had or alternatively hadn’t appreciated. For example a copy of Jimmy Smith’s “Softly As A Summer Breeze” BLP 4200 with Kenny Burrell and Philly Joe Jones just resurfaced at Beteg towers resplendent with ears and RVG stamps. Purchased in Budapest and consigned to gather dust on my EXPEDIT. Not the greatest LP by any means but the straight ahead version of Hackensack is a winner and I’m really enjoying listening to it as if it were the first time. I saw Smith play in Budapest a few years ago. He was at least an hour late and had to be physically carried to his hammond which duly broke down causing additional delay. But boy could that man play. Although I am a long-time Excel power user and was sorely tempted to do something like this, since I’ve discovered Discogs, I’ve realized having all that information in the cloud is really useful. Now that they’ve got an iPhone app, it’s a no-brainer. It will still take me years to get everything in (8K discs and growing), but as I buy, I enter and then do a small chunk at a time. The thing I like about Discogs is that it is Wiki-like in its self policing and is really helpful in getting me info on release dates/reissues/and rarity. I do grade as a I go because I like to stop and think about what I’ve got and if there’s anything noteworthy about it. And you can always download a CSV if you ever need to have the info local in list form. I use Discogs as a secondary reference source, it is great I agree, but what Discogs doesn’t provide reliably is a record of the essential detail of run-out etchings, cover finish, font-style, label tint, and vinyl weight, because virtually no-one recognises them as important enough to document. You remain hostage to what other people record. The discipline of documenting exact detail from you own collection is what opens up new windows, reveals patterns you wouldn’t otherwise see, like the relationship between Contemporary labels and mother/stamper codes, and cover address zip-code. I figure you have to decide your own dataset, according to what you believe is important. It is extra work I concede, but then a labour of love is not a burden, it’s rewarding. I’ve kept a spreadsheet of my records for years. It has a column for the year of the first recording on the disc (some records include tracks from a span of years). I sort by artist, then year of recording, then medium. I file the same way. Works for me. The recording dates are often on records. I use Goldmine’s Price Guide and the ALL MUSIC GUIDE TO JAZZ for help with dates. I make a guess as a last resort. Question marks instead of numbers when the date is unknown are useful to show the state of knowledge, but then the sort makes less sense. We old guys can make pretty good guesses. Cheers and thanks for your excellent site. I find your columns informative and judicious. I made a Google Drive spreadsheet somewhat similar to LJC’s (although not as extensive!!) So, viewable on my iPhone when I’m in the shop. A bit awkward, but better than nothing. I use Vinyl manager for the time being. Its decent and free. It also downloads cover art. any chance you can post a download file of the spreadsheet – i would pay a few bucks to have a copy. I have embedded a starter template as an Excel file, and uploadedto this WordPress page. If you click on the link, you should get back the template Excel file. I have not tried to do this before, so I don’t know if it gives you a useful starter file, but give it a try. All else fails, email me and I will post you the file direct. Yes! Finally something about system tools.